Irish C is a spacious four bedroom ocean side escape with all of the amenities needed to create a dream vacation. The home has a recently remodeled kitchen with new Stainless Steel appliances. Irish C has a wide open floor plan that allows ample room to spread out and relax while spending time with loved ones. The fully equipped kitchen has all of the comforts of home and brings the entire family together for fun-filled meals. 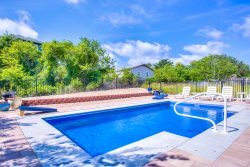 Irish C is in an ideal location to make the most out of your Outer Banks vacation. Family-friendly attractions, restaurants with local flavor, and local beach shops are all in close proximity. You will be digging your toes in the sand after a short stroll to the beach from Irish C. The home is the fourth house back from the beach access... and the beach is only 500 feet away! Multiple levels of decks present the perfect opportunity to take it easy and enjoy the tranquil Outer Banks environment. Sip your morning coffee with a front row seat to the spectacular sunrises over the Atlantic, soak up the afternoon sun as the fresh ocean breezes keep you cool, and close out a great day as you visit with friends and family under a night sky bursting with bright stars. Take a deep breath and unwind in the hot tub located on the second-floor deck. Bring your entire "family" on this year's vacation. Dogs are welcome at Irish C.
Irish C is the perfect home to build lasting family memories. Reserve one of the few remaining weeks today. Duck Community Information: Lifeguard Stations are located at Sprigtail Drive, Barrier Island Station, Schooner Ridge Drive, Four Seasons Subdivision, and Plover Drive. - Dogs are allowed on Duck's beaches year-round. - There is no public beach or sound access within the Town limits. Access to the sound and Duck's town beaches is limited to residents, renters, and their guests. Top-Level: Bedroom with king bed; living room; kitchen; full bath; screened porch. Mid-Level: One bedroom with two twin beds; full bath; master bedroom with king and attached bath; bedroom with bunk bed. Queen sofa Bed.